The Desire's successor finally lands but is it an improvement? We'd have to colour ourselves a little disappointed with the new HTC Desire HD - as a standalone phone it's excellent, but it has too many niggles to be considered the best in HTC's range. 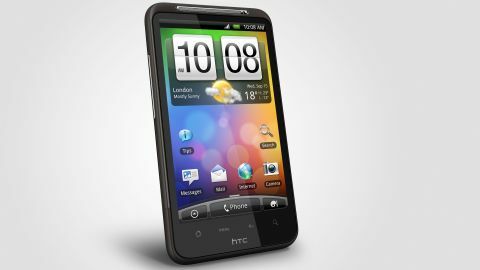 After the success of the HTC Desire, the Taiwanese firm is looking to take smartphones to the next level with the super-sized HTC Desire HD. But is it the next tech-filled talisman for the brand or a super-sized effort too far? We've all seen the HTC HD2 and the HTC Evo, both with the same-sized 4.3-inch screens, and they were both successes, so it makes sense to continue that theme on the latest Android flagship phone, right? Add to that it's got the overhauled Sense UI, with more new features than you can shake a techno-stick at, and there's a lot to be excited about with this new handset. We're not sure if there's been some optimisation on the screen, but the 4.3-inch offering from HTC seems to be packing a better contrast ratio since we saw it a few weeks ago at the launch. It still lacks the wow factor of the Samsung Galaxy S' Super AMOLED but it's certainly not a bad screen – just perhaps a bit light on the difference between the black and whites on the display. But there are those out there that think that OLED screens are over-saturated anyway, so perhaps it will appease rather than disappoint some. The slim dimensions (68mm x123mm x 11.8mm) are really important, and help to make the 4.3-inch screen more palatable to those that think it's simply too big. It doesn't feel as skinny as the iPhone 4 or the Galaxy S (well, it isn't at 11.8mm) but it's perfectly pocketable. The front of the Desire HD is mostly taken up by screen, as you can imagine when you have one as whopping as this. The four touch sensitive options are all easy enough to press and light up when the phone is in use – we'd still rather they were the physical keys of the original Desire, as it's much easier to hit them without taking your eyes off the screen. The dimensions of the phone are designed to minimise the trade-off of having a massive screen, but it only partly works. Yes, the thin frame makes it nice to hold in the hand, but in the normal portrait mode it's still nigh on impossible to reach the top of the screen without jiggling the phone around in your hand – something that's never an issue on the sleek iPhone 4. The top of the phone only houses the power/lock button, and like the HTC HD7, this is flush to the chassis and thus hard to even find, let alone hit without looking at times. There's a massive volume rocker switch on the left hand side of the Desire HD, leaving the right hand side completely clean – no power or camera key here, which gives it a nice smooth finish. Below the volume key is the battery cover – it's an odd one, as you have to yank it off and the battery then falls out, with no catch like on the HTC Legend. It's even more confusing when there's a separate sliding cover on the bottom of the Desire HD to get to the microSD and SIM slots. This cover isn't the best though – a few clicks on and off and we found it started to get a little loose, feeling creaky when gripped. There's an odd choice from HTC when it comes to the 3.5mm headphone port, as it's on the bottom rather than the top of the phone, next to the microUSB port. It means that the phone will be easier to pull out of your pocket already the right way up in your hand, but it just feels a little odd when 99% of other portable devices have it located on the top and out the way when holding it in the hand. At least it's central, so it doesn't get in the way when you're holding it for video watching. Around the back we're treated to an 8MP camera that also packs a dual LED flash, and also records HD footage at 720p resolution. There's also a small speaker that seems to be the main source of audio output – there's another on the front above the screen, but it feels like most of the sound pumps from the rear.